Best Door Hardware, Inc. has been providing high quality commercial grade door locks to Ohio contractors, retailers, and facilities managers for the past 25 years. Best Door Hardware Inc., offers the Best Access Systems® behavioral healthcare solutions products and locks. Facilities are challenged with maintaining a delicate balance of patient safety and security. The behavioral healthcare solutions portfolio provides a comprehensive breadth of products designed to meet these unique application challenges. If you do not see the lock you are looking for in Ohio, please feel free to contact us to discuss the type of commercial door locks you are looking for. You have come to the right place for your Ohio commercial door lock needs. 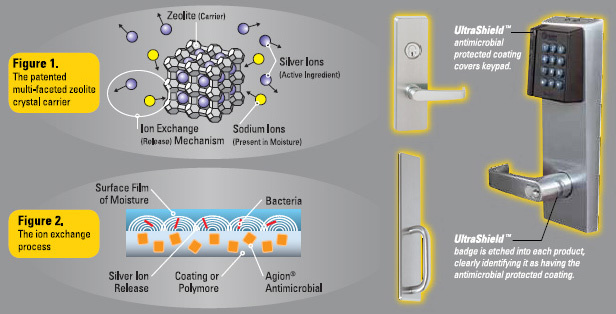 The UltraShield protected coating (by Best Access Lock) incorporates a naturally-occurring silver ion exchange that creates a sanitary surface. In doing so, the microbe food and oxygen supplies are eliminated, effectively producing a long-lasting product protection. The silver ion exchange occurs only on demand when destructive microbes are present as shown in figure1. The UltraShield protection is durable and is on guard 24/7. For more information, please call or send us an email.